Rais Jakaya Mrisho Kikwete akiwa na Kansela Angela Merkel wa Ujerumani, Rais wa Mali Mhe Ibrahim Boubacar Keïta, Waziri Mkuu wa Norway Mhe. Erna Solbergna Mwenyekiti Mwenza wa Bill&Melinda Gates Foundation, Bw. Bill Gates, wakiwa jijini Berlin, Ujerumani, kabla ya kuanza kwa mkubwa wa kuchangisha fedha katika mkutano wa kimataifa wa kujadili na kuchangia upya juhudi za kimataifa za taasisi ya Global Alliance for Vaccines and Immunisation (GAVI) ambayo imefanya kazi kubwa ya kusambaza chanjo duniani ambapo mpaka sasa watoto milioni 500 wamepata chanjo za kuzuia magonjwa mbali mbali na wengine milioni saba wameokolewa katika hatari ya kupoteza maisha. Rais Jakaya Mrisho Kikwete akiwa na Kansela Angela Merkel wa Ujerumani, Rais wa Mali Mhe Ibrahim Boubacar Keïta, Waziri Mkuu wa Norway Mhe. Erna Solbergna Mwenkekiti Mwenza wa Bill&Melinda Gates Foundation, Bw. 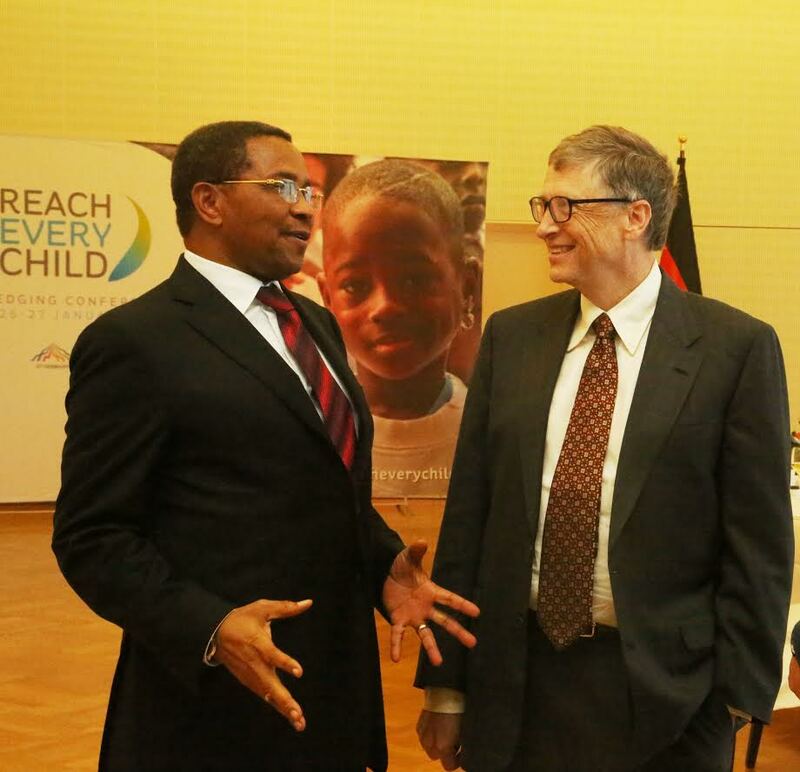 Bill Gates, wakiwa jijini Berlin, Ujerumani, wakati wa chakula cha mchana cha mazungumzo baada ya kumalizika kwa mkubwa wa kuchangisha fedha katika mkutano wa kimataifa wa kujadili na kuchangia upya juhudi za kimataifa za taasisi ya Global Alliance for Vaccines and Immunisation (GAVI) ambayo imefanya kazi kubwa ya kusambaza chanjo duniani ambapo mpaka sasa watoto milioni 500 wamepata chanjo za kuzuia magonjwa mbali mbali na wengine milioni saba wameokolewa katika hatari ya kupoteza maisha. 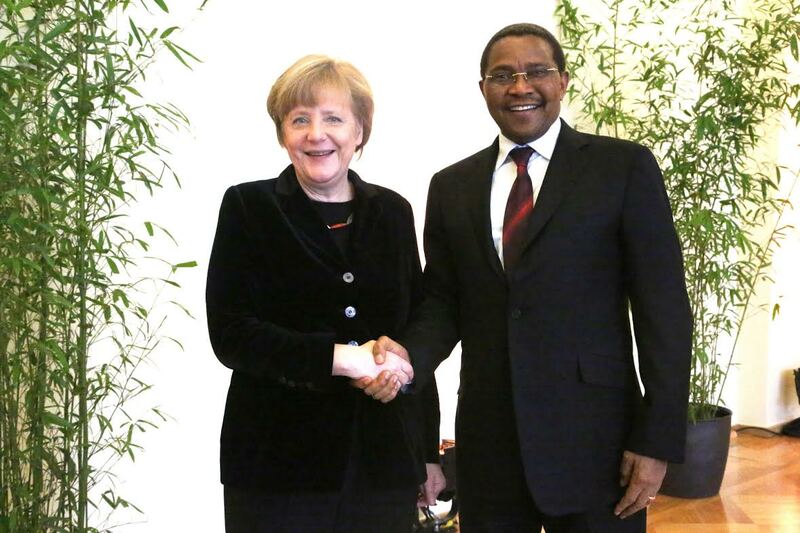 Rais Jakaya Mrisho Kikwete akiwa na Kansela Angela Merkel wa Ujerumani, baada ya kumalizika kwa mkubwa wa kuchangisha fedha katika mkutano wa kimataifa wa kujadili na kuchangia upya juhudi za kimataifa za taasisi ya Global Alliance for Vaccines and Immunisation (GAVI) ambayo imefanya kazi kubwa ya kusambaza chanjo duniani ambapo mpaka sasa watoto milioni 500 wamepata chanjo za kuzuia magonjwa mbali mbali na wengine milioni saba wameokolewa katika hatari ya kupoteza maisha. 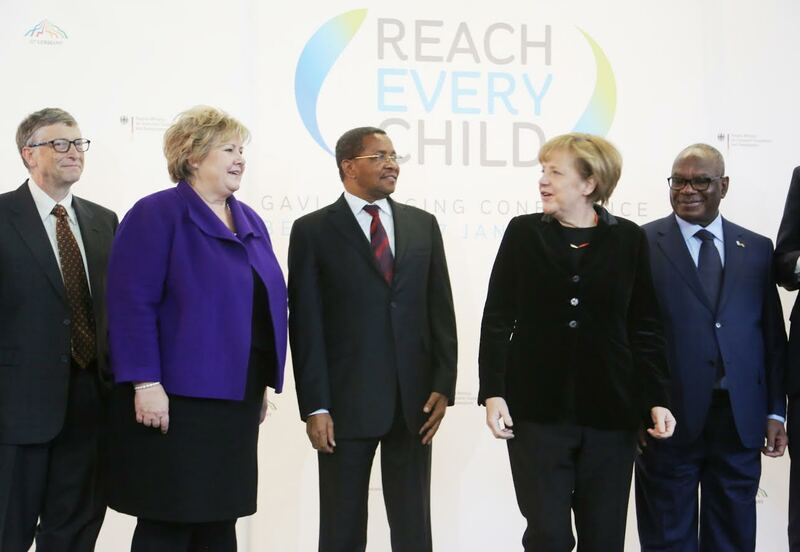 Hundreds of millions of children living in the world’s poorest countries will receive life-saving vaccines as a result of record-breaking financial commitments made at the Gavi Pledging Conference, hosted in Berlin by German Federal Chancellor Angela Merkel. 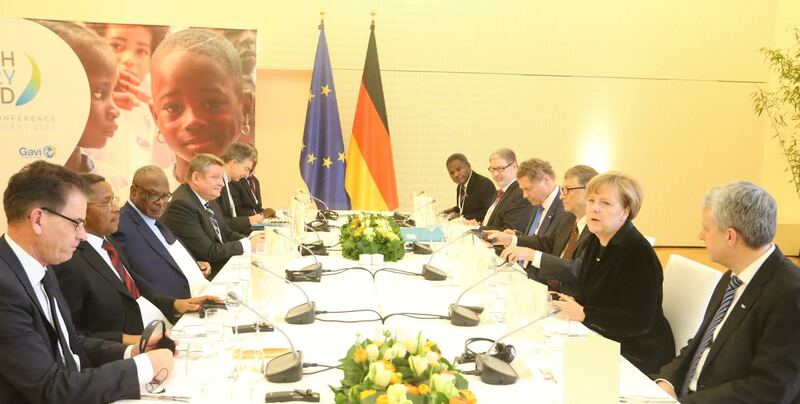 Chancellor Merkel was joined in Berlin by H.E. Dr Jakaya Mrisho Kikwete, President of the United Republic of Tanzania, and H.E. Mr Ibrahim Boubacar Keïta, President of the Republic of Mali, Erna Solberg, Prime Minister of Norway, Donald Kaberuka, President of the African Development Bank, Bill Gates, Co-Chair of the Bill & Melinda Gates Foundation, ministers from more than 20 implementing and donor countries, civil society groups, CEOs of vaccine manufacturing companies, UN agencies and others who came together to secure commitments to fully fund Gavi-supported immunization programmes in developing countries between 2016 and 2020. 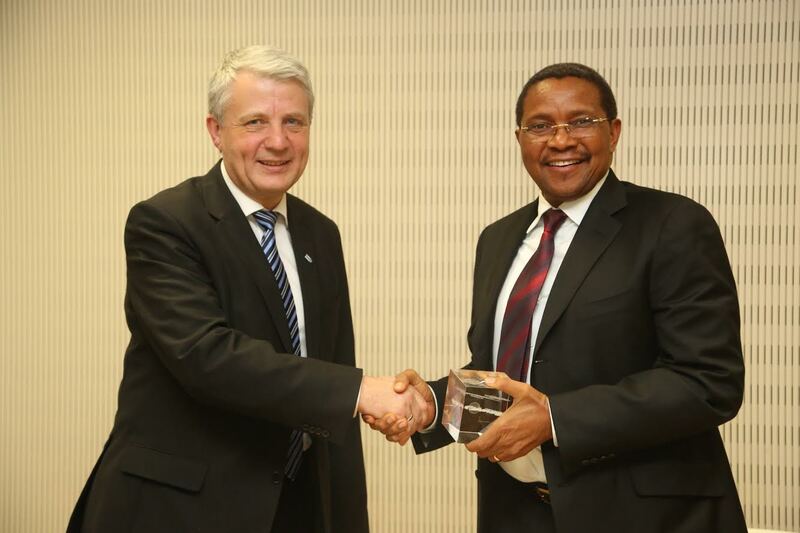 “Thanks to the joint commitments of developing countries, development partners, vaccine manufacturers and others, Tanzania is making great strides in protecting its children through immunisation,” said President Kikwete of Tanzania. “We are pleased to be working with Gavi to ensure our children – including those living in the most remote and inaccessible areas – are protected with modern, effective vaccines,” said President Keïta. “Today is a great day for children in the world’s poorest countries who will now receive the life-saving vaccines they need,” said Bill Gates. “We believe in the next 15 years, poor people’s lives will improve faster than any other period in history and that access to vaccines provided by Gavi are critical to making that happen. ” We believe in the next 15 years, poor people’s lives will improve faster than any other period in history and that access to vaccines provided by Gavi are critical to making that happen. Bill Gates, Co-Chair of the Bill & Melinda Gates Foundation The Gavi Pledging Conference, which was opened by Germany’s Federal Minister of Economic Cooperation and Development, Gerd Müller, saw unprecedented engagement from donors, with many deciding to double or even triple their commitments to support Gavi in what will be its highest period of financial need. China, Oman, Qatar and Saudi Arabia made pledges to Gavi for the first time. China’s pledge means that all BRICS countries are now making financial contributions towards childhood immunisation through Gavi. Developing countries are also increasing their financial contributions towards immunisation. Between 2016 and 2020, Gavi forecasts that implementing countries will allocate a combined total of around US$ 1.2 billion, which is additional to the funding provided by donors, towards their Gavi-supported programmes through the Alliance’s co-financing policy. This country ownership is vital to increasing the long-term sustainability of vaccine programmes. This entry was posted in Ziara on January 29, 2015 by Ikulu Ikulu.